My Indianapolis pool company was founded in 1987 solely to build fiberglass pools. We built no other type of pool until we started building vinyl liner pools in 2005 (and that's another story). I LOVE FIBERGLASS POOLS! The reasons that I built a fiberglass pool for myself 14 years ago remain valid today, and some reasons even resonate more true. Here are the Top 6. 3. Durability of Fiberglass In Ground Pools- Fiberglass pools have extremely long term structural warranties and Viking now has a 20 year finish warranty that is second to none! Do they crack and pop out of the ground? These are "disturbing thoughts" created by the unknowing! 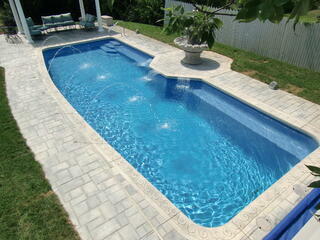 Built right and properly maintained, these pools provide an enduring long term and relatively trouble free experience. 4. Benches, Ledges and Creative Stair Options- Sometimes I am asked whether the more intricate fiberglass designs cost more. No, and this is a cool thing about fiberglass pools and is not true about other pools. The manufacturer builds a mold and there is no meaningful cost to the manufacturer or you for the benches, ledges, shape and creative stair options! Hence, most fiberglass pools provide added entertainment and function without adding cost!! 5. Quicker Installation- Because the shell is made in a factory and not in your backyard (as is the case for vinyl and concrete pools), they can be installed more quickly and in more kinds of weather. Generally, we build these pools all March and November--you can't do that with vinyl or concrete pools as temperature concerns are a big issue! 6. Factory Controlled Quality- I have seen our pools being built in both Viking's Texas and West Virginia plants. Viking takes these warranties they pass out seriously. I envy Viking's ability to quality control in a factory vs. in a 6-8 foot dirt hole with a thunderstorm bearing down. So what are the cons? Honestly, i think the big cons are cost and the size limitations. They cost about $3-10,000 more than a similarly sized vinyl/ steel walled pool. The larger the pool the more the difference in cost. But you get the above 6 benefits for this extra money!! You just have to decide if the extra cost is worth it to you. Considering a gunite or concrete pool? You will probably save money with fiberglass and suffer less pool headaches! As to the size limitation, this is a legitimate issue. Let's face it--we have some big yards and big familys in Indiana. Fiberglass pools peak out at 16' x 40' (15' x 39' water edge to water edge). If you want or need a larger pool, a fiberglass pool is not for you. 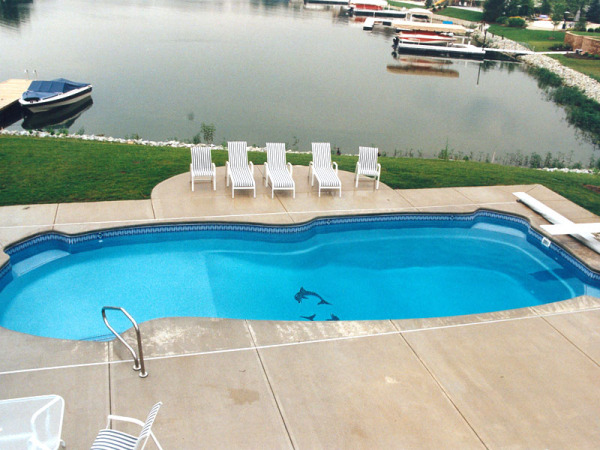 Since 1987, we have always been the largest fiberglass pool builder in the state of Indiana. We are never complacent and we are excited to improve and update our pools and processes each year.